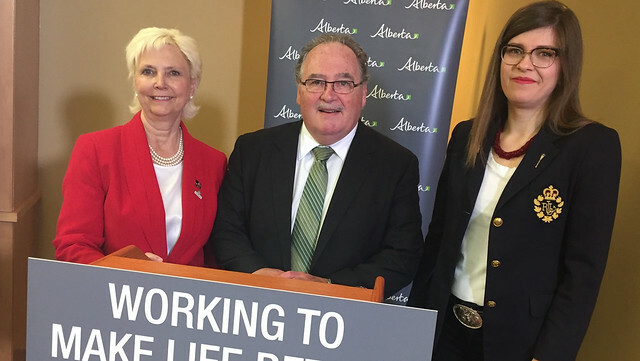 The Government of Alberta is improving access for trucks carrying heavy loads through major industrial areas north of Edmonton. L-R: Mayor Katchur, chair, Industrial heartland Association, Minister Mason and Jessica Littlewood, MLA Fort Saskatchewan-Vegreville, announce a construction project to make travel easier and more efficient for heavy truck traffic. Budget 2018 includes a $90-million investment in the Highway 38 bridge across the North Saskatchewan River, south of Redwater, that will be upgraded to carry heavy and oversized loads. The new bridge will establish a critical link in Alberta’s High Load Corridor, saving heavily loaded trucks about 200 kilometres of travel. Alberta Transportation expects planning and design to begin in 2018 and there will be additional highway improvements in the area as well. Approximately 2,000 vehicles cross the Highway 38 bridge every day. In 2016, 401 heavy loads travelled through the existing High Load Corridor, about 200 kilometres to the east. Carriers will save an average of $10,000 per trip compared to the existing route. The new structure will be able to accommodate loads of more than 200 tonnes. The project will support 265 direct construction jobs and 190 indirect jobs in associated industries.